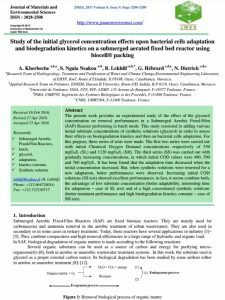 Abstract: The present work provides an experimental study of the effect of the glycerol concentration on removal performances in a Submerged Aerobic Fixed-Film (SAF) Reactor performing in batch mode. 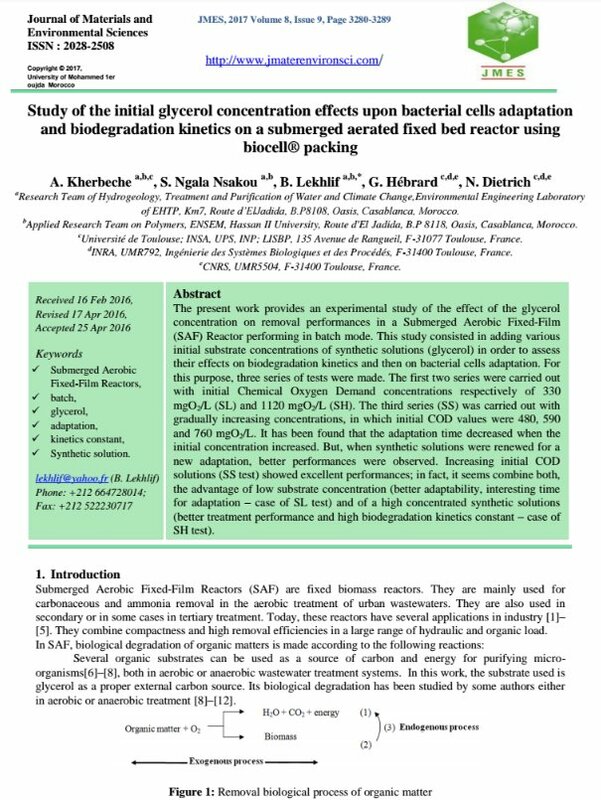 This study consisted in adding various initial substrate concentrations of synthetic solutions (glycerol) in order to assess their effects on biodegradation kinetics and then on bacterial cells adaptation. For this purpose, three series of tests were made. The first two series were carried out with initial Chemical Oxygen Demand concentrations respectively of 330 mgO2/L (SL) and 1120 mgO2/L (SH). The third series (SS) was carried out with gradually increasing concentrations, in which initial COD values were 480, 590 and 760 mgO2/L. It has been found that the adaptation time decreased when the initial concentration increased. But, when synthetic solutions were renewed for a new adaptation, better performances were observed. Increasing initial COD solutions (SS test) showed excellent performances; in fact, it seems combine both, the advantage of low substrate concentration (better adaptability, interesting time for adaptation – case of SL test) and of a high concentrated synthetic solutions (better treatment performance and high biodegradation kinetics constant – case of SH test).